Now I look back at it, I realise this was my first book, published in 1981 when I was still working (just) on Sound International magazine. I rounded up the writers, edited it, and wrote some of it. The idea was to cover all the instruments of rock music. So we had chapters on acoustic, electric, and bass guitars; drums and percussion; keyboards; synthesizers; effects; woodwind, brass, and strings; amps; PAs; and a couple of chapters at the end on the mechanics of playing live and recording. The writers included Adam Sweeting, Richard Burgess, and Gary Cooper. It was unprecedented at the time and made quite a mark. And looking back at it … it all looks rather dated. 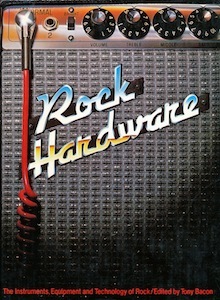 I imagine now it would be called Rock Software. A good first effort, I suppose, but for the time being it did nothing to persuade me that I should give up my magazine job. That came later (by which time I was on a different magazine). Here’s a rare (and positive) review of the book, published in People magazine in 1982.